Marc Austin monitors radar and issues warnings at the National Weather Center in Norman, Okla., on Thursday. Monday's tornado in Moore, Okla., killed 24 people and caused an estimated $2.2 billion worth of damage. As the community reflects on what happened, one question is: How did so many manage to survive such devastating destruction? Lifelong Oklahoman Kristi Freeman has seen her share of tornadoes, but she says the twister that tore through her neighborhood Monday was something else. "This tornado was like a monster. It was like something that was alive. It destroyed your peace, your comfort," she says. And it destroyed Freeman's home in Moore. Now she's one of more than 300 neighbors taking shelter in college dorms at the University of Oklahoma, just south of Moore in the town of Norman. Freeman says growing up in Oklahoma means you always pay attention to tornado warnings. "Oh, yes! In Oklahoma, oh, my God, yes! But even before the warning, if it looks cloudy outside, you check the news. You find out what's going on in your area. You never take that for granted," Freeman says. About 10 minutes from the dorm shelter where Freeman is staying is the National Weather Service's Storm Prediction Center. It was first to broadcast the earliest reports of Monday's tornado. The brick and stone building with glass curtain walls is a hub for tornado forecasting — and for tourists. "There are some people who plan their vacations around this building," says meteorologist Rick Smith, who has worked there for more than a decade. On Monday, he was stationed in the heart of the building. 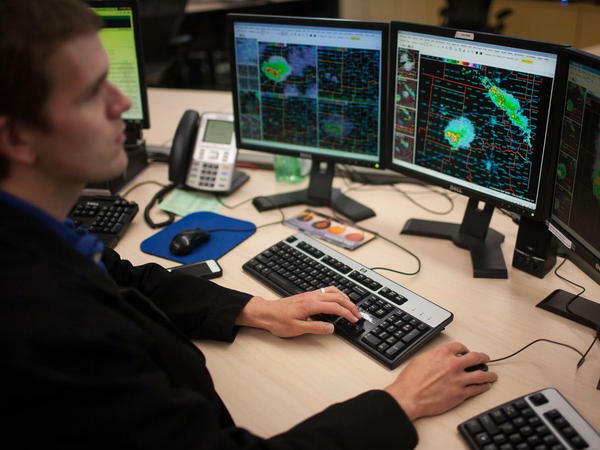 Meteorologists are stationed in a set of fishbowl-like rooms facing a sea of computer monitors and TV screens tracking storms — surrounded by glass walls. "It's configured this way with all this glass because there's an intense interest in weather here in Oklahoma," Smith says. "This building has 30,000 to 40,000 people that walk through it every year. It's a tourist attraction." Meteorologist Daphne Thompson, who often leads tour groups through the center, says she's surprised there were only 24 deaths from Monday's tornado. "I'm very shocked that the number is so low. I mean, it's always horrible to lose people, but considering how much damage it did, and that there were children in school and people driving down the interstate, I find it very surprising that there were so few fatalities," Thompson says. Co-worker Smith says he's sure the relatively low death toll isn't a coincidence, but he's not sure what exactly worked. "I'm really very, very anxious to hear some of the stories about what did people do. How did so many people get through this tornado? It's not an accident. It's not just luck or chance that the death toll is that low," he says. Smith credits, in part, a close working relationship between the Storm Prediction Center and local emergency managers, plus school and hospital administrators. "They can actually hear it in our voice, or read between the lines of the words we're using, that 'Oh, gosh, they're really concerned about it this time. This is really one of those days,' " Smith says. Back at the dorm shelter at the University of Oklahoma, Kristi Freeman's teenage son shoots pool in a makeshift play area while she sits back on a couch nearby, reflecting over the past week. Freeman wants to stay in Oklahoma, but she's done testing her luck in Moore. "I love Moore, but I'm not staying there anymore," she says. As for the names that we'll be hearing this year, the first four big storms will be Andrea, Barry, Chantal and Dorian. Hurricane season officially begins on June 1st. Transcript provided by NPR, Copyright NPR.